We finally got on the road. Mario, being Italian (and a man) insisted on driving, so I was in charge of navigation, music and entertainment. We spent the long hours up to the Canadian boarder enjoying the beautiful scenery, chatting (on the phone) with my family and talking about everything under the sun. It didn’t seem possible for Mario and I to grow bored with each other – or to run out of things to say. Slowly the argument that we had before leaving the house faded and a healthy level of enthusiasm about the road trip resurfaced. Niagara Falls was magnificent. Taking advice from friends to stay on the Canadian side, we had reservations at a delightful bed and breakfast (which served the most delicious French toast – with real Canadian maple syrup – that I had ever tasted). 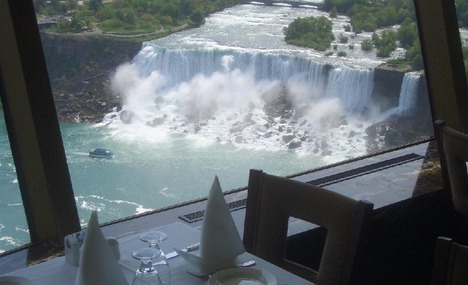 Thursday morning we headed down to the falls and basked in their majestic presence, complemented by a trip on the Maid o’ Mist and lunch at the tower with a breathtaking view. As we were in a place that was new to both of us, the dynamics began to shift. Now in unfamiliar territory, the home court advantage was completely erased and we had to lean on each other as we laughed our way through every opportunity, challenge and missed direction. As the hours passed, the closeness that had built over the first week returned. As we headed to our second site, Palmyra, the feeling of normalcy – the ease of working together – intensified. And the giddy feeling returned. We ate dinner that night at a charming steakhouse in the middle of nowhere New York. After a few days of road trip food I wanted a solid meal and Mario was eager to try his first, real American steak. We were dressed up for dinner – I was in a killer dress and heels and Mario was in slacks, dress shirt and tie – and the ambiance of the steakhouse was completely bewitching. Low lighting (with candles), soft music, fire crackling in the corner. Mario and I were placed in a back corner table and as the courses came out, the conversation took a serious turn. The moment had come to fully recap everything that had transpired since Mario and I had met – the months of writing, the anticipation of the visit, and the ups and downs of the first week. By the time the dessert arrived (a to-die-for chocolate cake), Mario and I had disappeared into our own world. Hands entwined, heads together, Mario began talking in earnest about the thoughts and emotions that were running through him. With each breath, he opened up his soul: how I was different from anyone he had ever met; how he valued my personality, my life experiences, my values and my goals in life; and how deeply he was coming to care for me. I drank in every word. Just as I felt like there was nothing more he could add, that we were going to end this night in a perfect cloud of bliss, Mario, once again, managed to take me by surprise. During Mario’s speech he started talking about his own life: where he currently was with his job and his future goals; how much he wanted a partner by his side; and the qualities that he was looking for in the woman with whom he would share life’s journey. Then, suddenly, he paused. Pulling me in even closer, he took a deep breath and looked deep into my eyes. Admitting that this was spontaneous, that he had had no plans of saying any of these things tonight, he asked if I would willing to consider taking that journey with him. Joy infused his face and happiness radiated from every pore. The rest of the evening was a bit of a blur. All I could think about was one thing: What did I just agree too? I had been caught in the moment, the romance of the setting, the love behind his words. “Yes” had bubbled out of me without any thought as to the significance of the question. Had he just proposed? Did I say yes? Or was it simply more of a question of whether or not I was on the same track as he was – feeling good about future prospects and admitting that we were headed in that direction? This entry was posted in 2010, Choices, DC, Mario and tagged awkward, best friends, Canada, Choices, DC, flirt, Mario, marriage, memoir, memories, niagara falls, relationships, road trip, romance, steakhouse, travel, vacation. Bookmark the permalink.